The Messiaen recording was awarded a 2007 Grammy in the classical category "Best Instrumental Solo with Orchestra." "Jack Gallagher is a professor of great accomplishment and a composer of refined sensitivity. 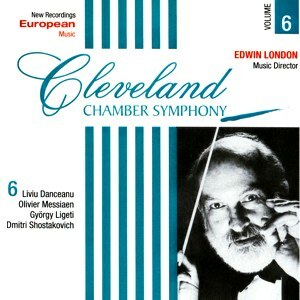 He brought all his tremendous gifts to bear upon the Cleveland Chamber Symphony's Grammy-nominated recording, for which he was the producer. The acuity of his ear and the musicality of his contribution was such an influence that it would not be an overstatement to say the nomination earned by the recording wouldn't have been possible without his insightful guidance." "I attribute the success of the recording to (Gallagher's) impeccable ears, insight, and gracefulness with the artists. At every moment, there was confidence and appreciation in having him as the producer. As a composer, he understood the essence of the score and intertwinings of the instruments." "I am positive that we could not have achieved our success with this recording without (Gallagher's) musical vision and ears. He was the best producer I have worked with, and I think the team we had was magic." "We in the music department at The College of Wooster are immensely proud of Jack Gallagher's achievement as producer of the Grammy-winning recording featuring pianist Angelin Chang with the Cleveland Chamber Symphony in Olivier Messiaen's fascinating work for piano and orchestra, “Oiseaux Exotiques." Although in a sense we are amazed that one of our number had a role in a Grammy-award winning recording, in other ways we are not. Wooster's music faculty and students have grown familiar on a daily basis with Jack's keen listening skills, steel-trap memory, fine judgment, perseverance in the pursuit of excellence and fairness even in the face of stiff obstacles, and devotion to contemporary music and the composers-including his own students-who create it."